Duck legs usually contain more fat compared to chicken and the meat is tougher too. To remove the fat and slowly tenderize the meat, I first rendered the fat from the skin at medium heat. After almost all fat was rendered, I turned up the heat and roasted the rolls on all sides and finished the meat in the oven. The result was not as soft as duck leg confit, but this wasn’t my purpose either. As garnish I cooked salsify in two ways. I wrapped half of the sticks in aluminium foil, baked them in the oven and blended them to a fine puree. Baking salsify is so simple, because peeling the cooked sticks is not sticky at all and discoloration is easily avoided. I cooked the remaining sticks just before serving the dish in vanilla milk until they were al dente. Duck works well with many different fruits, so I added some quince to the duck sauce and plated the dish with a few drops of bright orange mandarin puree. I finished the dish with some basil oil, which added both color and freshness, and paired well with the salsify and the duck. Wash the duck legs with cold water and tap dry with kitchen paper. Using a sharp knife remove the bones from the legs. Carefully remove the sinews. Roll up the legs, fix with kitchen twine, cover with clingfilm and refrigerate. Wash and dice the parsley root, carrot, onion and celery root. In a large pot brown the diced carrot, parsley root, celery root and onion on some oil in batches. Always add only a single layer of vegetables to the pot so it browns and doesn't cook, then set aside and continue with the next portion of vegetables. Roast the bones removed from the duck legs on every side in some oil. Add about 200ml water and scrape off the brown parts from the bottom of the pot. Add the roasted vegetables, 1 garlic clove, the celery and parsley greens, 1/3 diced quince with its skin and seeds, 1 tbsp whole black peppercorns and a pinch of salt. Add enough water to cover everything. Cover with a lid and bake in the oven at 100°C / 210 F for 8 hours. Strain the liquid from the pot and remove the fat. Reduce the stock over low heat until it starts to get syrupy. Season with salt and keep warm. Wash the mandarin with hot water to remove any wax from the skin. Pierce the mandarin with a knife. Cover the mandarin with enough water, cover with a lid and bring to a boil. Drain the cooking liquid and start over with fresh water. Repeat this blanching process 4 times. Cut the mandarin in pieces and discard the seeds. Blend into a fine puree and press through a fine sieve. Cover with clingfilm and refrigerate. Keeps refrigerated for about a week. Wash the basil. Holding the thick end of the bunch, shortly blanch the basil in boiling hot water, then chill immediately in ice-water. Drain and cut off the thick ends you were holding. Coarsely chop the blanched basil and weigh. Add the double weight neutral oil and blend well. Leave for 3-4 hours in the fridge, then drain through a coffee filter. The resulting clear green oil keeps for 5-7 days refrigerated or several month in the freezer. Wash the salsify until all earth is removed. Wrap the two most curved ones in aluminium foil and bake in the oven at 200°C / 390 F for 1 hour. After baking allow to chill to room temperature, unwrap and peel the salsifies carefully discarding any black spots. Blend the salsify with 1 tbsp butter. Add enough milk to get a creamy texture. Season with salt and freshly grated nutmeg and press through a fine sieve. Add the duck legs to a dry pan with their skin side down and render the fat from the skin over medium heat. When almost all fat is removed from the legs, raise the temperature and brown the rolled legs on all sides. Season with salt and pepper. Turn the legs with their skin side up and bake in the oven for 30 minutes at 160°C / 320 F. After baking, allow the legs to rest for some minutes at a warm place. Remove the kitchen twine and slice the legs. Warm 250ml milk over low heat. Add a pinch of salt and a 1cm piece vanilla bean cut in half. Wearing plastic gloves, peel the remaining 2 salsifies and cut into 4cm long tubes. Add to the vanilla milk, cover and cook until the salsify is al dente. Periodically shake the pot to turn the tubes. Warm the mandarin and salsify puree over low heat. Put 1 tbsp salsify puree on warm plates and spread across the plate using a comb-shaped dough scraper. Drain the salsify tubes shortly on kitchen paper and add one standing and one laying next to the puree. Add 3-5 drops of mandarin puree. 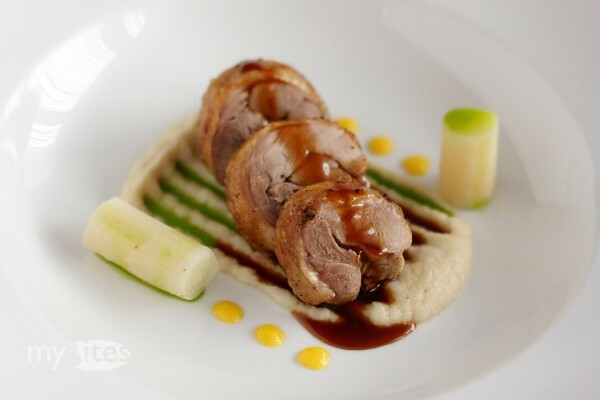 Arrange 3-4 slices of a duck leg on the puree and glaze with the quince sauce. Sprinkle the salsify tubes with basil oil.